I am such an Aussie bloke at times. I say this with no pride. R tells me he mentioned this to me three times and I did not pick up on it. Eventually after he said he refused to tell me again I did some research, and came up with the wrong thing, except he did not know that. He wanted to see La Boheme as an open air performance on the shores of Farm Cove in Sydney. This is surely the location where his English sister was married with the backdrop of the Opera House and Harbour Bridge when we were the wedding planners, ever so many years ago. Wouldn't it have been so nice that on R's birthday in March, I could have presented him with the ticket for an April performance when I am on holidays and say, guess what? We are going to La Boheme in Sydney. Instead he did the booking of the performance, the flights and the single night of accommodation and I said, I will pay for your ticket for you birthday. I am just so also ran and pathetic. That is me. I think I have been to an opera, perhaps Madame Butterfly, and it made me cry. It was many years ago and I can't really remember. Anyway, our friend in Sydney Victor is joining us to see La Boheme, so what fun! I've no idea what the opera is about and like I now never look at movie trailers, I am not looking up the opera La Boheme. It will be a surprise. So yes, R booked our air fares and one night of accommodation, along with the tickets for the performance. I do my share. I have booked us and our Hair Dresser Friend flights to Launceston to see our Dyke Friend, and dog Jack later in April. The day after we return it is HDF's birthday, so we will celebrate her birthday at Mudhole, or is that Mudcrab in Launceston. Mud something. We will stay with our friend for two nights. Originally it was going to be two weeks of touring Tasmania, but medical appointments and family birthdays mean we really have to be home and only go for the weekend. Oh well, a little taste of Tassie is good, and surely will tempt us back for a longer visit. We loved our visit over a decade ago. 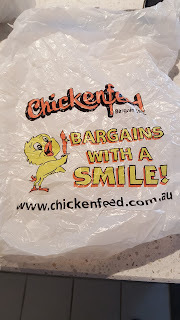 Wardrobe clean up #27, I came across this plastic bag from the last time we were Launceston. 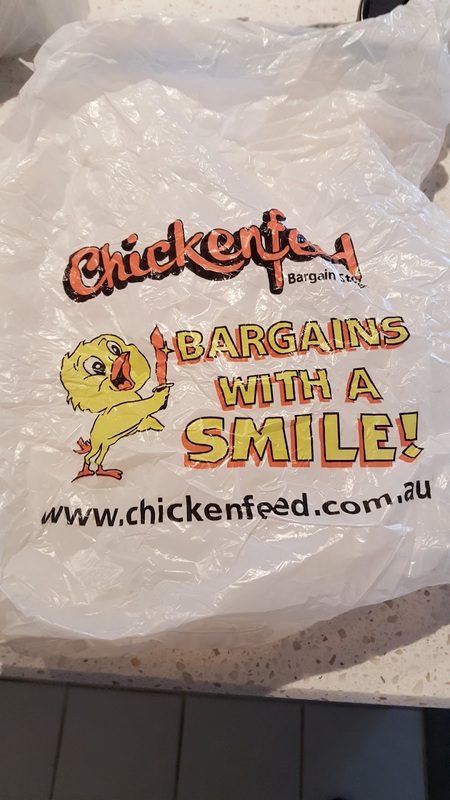 Prices were chicken feed. We were very amused at the time. It looked like a shrink wrapped packet of olives, but on closer examination, it was chocolate covered confectionary from Haigh's Chocolates sitting on the fridge shelf. R generously allowed me to take four to work, as some comfort food. I ate two and the filling of them stuck to my teeth. I thought, these gluey fillings are going to rip out my teeth fillings. I returned two to the packet and told R, I did not really like them, which I didn't, and that I thought they may rip out my fillings. I went to bed and R stayed up later and ate another couple of his chocolates. The evening of the next day R said I was partly right. They did not rip out his fillings, but took off the top of one of his teeth which was now sharp and cutting into his tongue. The tooth repair, a cap, will be $1000, plus the adjacent tooth showed a crack in an xray, so that will be $2000. He is now up to $7000 for medical expenses this financial year, and ok, he has had top medical people and the best of care, the best of hospitals and treatments at the time of his choosing, yet isn't the private health insurance premium we pay supposed to cover private health care? It seems not. Had he have gone as a public patient, it would have all cost him nothing. But nothing timewise would be at a time or date he chose, and nothing was life threatening, just inconvenient and troublesome, so he would have been on a waiting list. That is not to negate the seriousness of his issues. I've done both public and private, and three times I was treated pretty well by the public system. It helps if you have a doctor who will speak up for you to the hospital. It is amazing what a phone call from a doctor can achieve. My private experience, with private health insurance, for surgery and a two night stay in hospital left me out of pocket for over $1,000. I may have had to wait for two or more months for the same surgery in a public hospital, and I rather wish I had. Yes, it is rare for us to be out so late at night. Re-reading old diaries found during my wardrobe cleanup, I am amazed at how late we would stay up at times, and I would go to work the next morning at perhaps 6 o'clock. Ex Sis in Law's husband found a cheap overnight stay in a city hotel and bought it for her as a Christmas present. Middle Niece went along too to share her mother's room and Fire Fighting Nephew and his wife booked the room next door. I thought it would be a nice thing to have a bottle of bubbles (France tells us we are verboten from calling it champagne) and a platter of nibbles to be delivered to their room on arrival, so I rang the hotel. The bubbles, no problem. I will speak to chef about the platter of nibbles, said hotel staff. He came back on the line and said chef could prepare some pretzels to go with the champagne! Ok, that will have to do. We met up with them at Arbory for pre dinner drinks. It is the longest bar in the world. That is a drinking bar/cafe, not a counter bar. It is the length of a long train platform, which is what it was, platform 11 at Flinders Street Station, once used by the St Kilda and Port Melbourne trains, that are now light rail/tram routes. I took this photo as we were leaving. The place, as I have heard R's younger relatives in England say, was heavin'. The women were drinking decanters of Pimms, the sweetness combatted by citrus peel. R had a couple of Asahi beers and I had a couple of g&ts. We walked across a bridge to Southbank and then a good way along to the Italian restaurant Baci. Both R and my eyes rolled in our heads as we saw the prices but no one else batted an eyelid. Proof #2 that we are old. As Nephew had bought bowls of chips to eat with our earlier drinks, R and I shared an antipasto dish and a garlic focaccia. Goodness, another pontoon bar on the river. Interestingly the chips came with tomato sauce for dipping, ketchup if you like, and a black sauce, from the US, that was very nice. It was thin and very spicy. Black sauce? I was seated but the others weren't as a 'bicycle rave' went past. Nephew googled it and it happens twice a year. There were lots of music players pumping dreadful music out, but what fun. From there Nephew found an underground bar, deep in the foundations of Crown Casino. The angled support structures caused some service difficulties but we had a lovely time, with more cocktails. R insisted we pay for dinner, over $300, as I sputtered, ah, umm, well...coming out of your inheritance. Nephew paid for cocktails at the bar. I had a martini and never before have been asked if I wanted a vodka martini or a gin martini. Gin of course, not shaken. I don't want the gin bruised. It came without an olive! What brand of gin, I was asked? I couldn't remember my favourite gin, Gordons, but I could remember the name of Jah Teh's favourite gin, Bombay Sapphire, so that is what I had. We parted company at Queensbridge where the family caught the 58late tram to the north of the city where they were staying and we caught the 58late tram to home. From Facebook, they managed to find a laneway bar on their way back to the hotel and had another drink. We were in town today to see a mock up of our new train and some brunch and walked along the river. Here are a couple of shots of Arbory, much quieter than when all hundreds of metres of it was packed full of people on Saturday night. The Arbory pontoon on the Yarra River. Packed on a Saturday night but empty on a Wednesday morning. Good to get out and be social on a Saturday night, but the late night meant we did little the next day. Well, a little bit. The second depressing post in one week. I will try to have something a bit cheery tomorrow. Had this happened years ago, the recently departed this earth Dr Hugh Wirth would once have been seen in a news clip on tv thundering on about the outrageous deaths of 16 polo ponies. As I have said in the past, I am not keen on horses but I never want to see them harmed. Polo ponies were transported using proper horse transport vehicles and the Spirit of Tasmania ferry to Tasmania for a competition but upon their return journey to the mainland and and then on to New South Wales, they nearly all died. Aside from it being very warm weather which could be relevant, the cause of the deaths is not known. Of course the deaths are under investigation and hopefully the cause will released to the public and not swept under the carpet. Someone is responsible. Were the horses poisoned, was it a lack of care or was it a communicable disease? The Spirit of Tasmania media manager person was straight to the offensive and immediately cleared itself of any blame. We don't allow people down on the livestock deck while sailing for security reasons, although exemptions can be made for veterinary treatment. Well, how will anyone know if an animal becomes unwell and need veterinary treatment if no one is allowed onto the livestock deck to check? It's security, says the management of the Spirit of Tasmania, but clearly not the security of the horses. Now, of course the horses are not let loose on the ship to graze on hay or drink from troughs. They will have stayed in the horse floats. The lead time from when the horses were loaded onto trucks to the time when the Spirit set sail must have been at least two hours. The sea journey takes eleven hours, so we are up thirteen hours. While I don't know when the horses' deaths were discovered, they were journeying on to NSW and the autopsy is happening in Albury on the border of Victoria and NSW. So add three more hours on the road to near Albury that they have been in the horse floats, plus one hour disembarkation from the Spirit. So what are we up to with my guesstimates? 2+11+1+3 = 17 hours in a horse float in stinking heat. I expect they died well before the 17 hours. I can't imagine the practicalities of feeding and watering horses over such an extended period in very hot weather in a horse float, but surely that would be part of standard horse transport of great distances in heat? Surely? It is always a safer and easier option to let the system take its course, but on this occasion I will call it. Criminal charges of some sort need to be laid against someone. Sixteen horses don't just fall down and die without good reason. R: You know how my bank card won't work for tap and go. I've ordered a new one. Me: Good. You are trying to go cashless, but how can you when your card won't work properly. R: But they have cancelled my old card. Me: I am sure you have another card to use. R: I don't know that I do. Me: My interest rates are very reasonable. My fingers did something on the keyboard and deleted today's post. How annoying. Here is a quickie then. This classic apartment block in Adams Street, South Yarra looked set for demolition. This is post renovation, but it looked similar before the works began. We liked it. The work was very slow, over at least two years or more, but eventually it all came together. R and myself chatted to one of the residents and she just loves her apartment and living there. The photo above is from street side. Below is what we see from The Highrise. Yes, yes, yes, renovate, reinvent, extend, adapt but don't demolish. Pretty stylish hey. I would hate to look at prices, but they would be mind blowing. In memory of Aiden, Damien, Danielle and Freya. From old diaries read after the wardrobe clean out. More to come. Almost in another lifetime, R was a carer of disabled children and youth. Some were severely disabled, others not as extreme. Some were disabled from their mother's taking the evil Thalidomide for morning sickness during pregnancy. Let me tell you about a few, and one very special one and the most awful way he died. I came to know them, as staff would often take them home for a weekend or overnight to break the monotony of their lives, the children that is, not the staff. It was generous of staff to do so and as far as I know, there weren't any problems. Three staff and two quite disabled lasses, who could at least walk in a fashion, came to our house for a barbeque. As far as I can recall, both lasses, Freya and Danielle, died not too long later. Totally helpless were two lads, Aiden and Damien. Aiden was about eight years old but the size of a two year old and totally dependant on staff for him staying alive. I think at times he maybe tried to use his eyes to communicate but was generally unresponsive. We used to lie him in a beanbag in the lounge room. He had fine blond hair and an angelic face. His mother used to see him once a week, but he never showed any sign of recognition. It was not too long after R left that job that he died of natural causes. Damien stole our hearts. He was no more than a metre tall, totally helpless, with a freckled face and curly black locks of hair. He knew more of what was happening around him than Aiden, although he was completely unable to move or communicate. He would readily smile, and at times giggle. He was about fourteen when I came to know him, when R first brought him home for a sleepover. He was a mature teenager trapped in a tiny body with very little brain function. Or course I did not participate in the messy part of their care, of which there was much. R took it all in his stride. Once we were taking Damien out somewhere, perhaps a walk in the park, where he would be in a lightweight wheelchair. I was drumming my fingers in the car, ready to go. What is taking so long? I went back inside and R said, Damien's got an erection and I can't get his nappy on. Damien was not a victim of Thalidomide. He we deprived of oxygen when he and his twin were born, by being strangled by the umbilical cord. His parents were nice people. They looked after Damien when he was very young. On a family outing to a large water storage dam, they looked after Damien so well, they failed to notice his normal twin brother toddler walking towards the dam waters. Damien's twin brother drowned. Damien also had chronic chest problems and had to always be put to sleep on his side, otherwise he we suffocate or drown in his own fluids. At the age of 17 Damien went into a major hospital for a hip operation to make him more comfortable. Staff informed the hospital that he must be always left on his side to sleep. A note was also slapped on his bed. I don't know if it was before the operation or after, but what did the hospital staff do? Left him to sleep on his back and he choked or drowned in his own fluid and died. General nurses and doctors are not clued up on care for the severely disabled but the care for him had been reinforced. This was all so long ago. If it happened now, there would be hell to pay and there should have been back then. To say R was distressed by the unnecessary premature death of Damien is to understate. 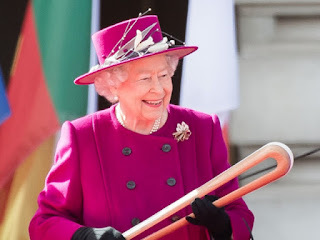 In advance of the Gold Coast Empire Commonwealth Games the baton is travelling through our municipal area tomorrow. It is then transported to the Bellarine Peninsula and Bone Doctor will run with the baton for a kilometre or so in the Borough of Queenscliffe. I expect she earned the privilege because of her high level of fitness and unpaid volunteer contributions to the community where she and Sister live. It would have been nice to see her run and cheer her on, but it is a working day for me tomorrow. Oh my Queenie, your baton does look rather odd. There comes a time when a bloke has to do what he has to do and hang up his high heels. I barely passed the drag test when I was younger. I am well past it all now. I don't know that I ever paid for anything pictured. It was all given in free spirit as an encouragement to participate. I liked my heels better when when they were black, red and silver. They began life as black patent leather. I dragged up about four times in my life. It was fun, but also hard work. Drag queens have my utmost respect for their dedication to duty. I have quite enjoyed destroying some of my history. The 1990s computer tips have been goned, along with hand written web addresses and email addresses. I can't imagine now why I wrote them down, from today's perspective. I did read an old tip that if you hold down the shift key, your computer will restart. That doesn't work now, if it ever did. Maybe it did in Windows 3.195. I didn't take a before photo here, but how much better is is now, cleared out. The Pierre et Gilles calendar might be worth a couple of bob. I think that was won from Joy Melbourne. There are some other calendars with personal meanings to me that I kept. Don't ask what is the shoe box, or in my bedside cupboard. The are part of my history that are no longer relevant, but I can't bear to be rid of them. You have to save some stuff for the future to be rid of. Two absolutely full crates have been reduced to one lightly filled one. Travel brochures, work stuff, Mother's letters, goned. All goned to one lightly filled crate. Forty years worth of theatre programmes, kept. The bag of Mother's letters, goned. Proof about the length of Mother's letters, page 19 but there was an extra sheet as well. Real estate brochures, goned except for those for our own places and that of friends, which have been moved into the filing cabinet. What is up in this crate? The label says Diaries, Magazines and IT. It does not say drag paraphernalia, but that was there too. Much neater and now holding other bits of important stuff that were lying around in other parts of the wardrobe. Not quite goned as I will have a flick through them, two PC User magazines from the 1990s. They came with free cds. A couple of years earlier, they would have been free floppy disks. About six issues of Outrage Magazine, still kept in the hope that they may be useful as a piece of history. I expect the Lesbian and Gay Archives already have more than one copy of all. Also, one copy of OG magazine from the 90s, nice work Ian. Somewhere on bookshelves are a number of copies the British magazine The Face, including the one that outed Jason Donovan and then had to pay big time when he sued. We will never see such high quality magazines again. Ikea and Freedom Furniture catalogues dating back to 1994, yes one per year until a couple of years ago. It is amazing how little Ikea furniture has changed over two plus decades. Yeah, no, really, well, I can't do much about this drawer. Lavazza Coffee calendar in behind, won from Joy Melbourne ever so many years ago. Is it chicks showing bosoms? I doubt I would have kept it if it was. I can't remember and it is too hard to get out. Note, one crate is goned. When we recarpeted, Sister said, it is exactly the same colour. She was wrong, as you can see between the old and the newer, and it was a mass slaughter of nylons to make our old carpet, not so many nylons in our present carpet, just more (hopefully) humanely shorn sheep wool. I tried with the other side of the shelf, but very little reduction. A picnic set and a Thermos set given to me by work I foolishly consulted R about and he implored me to keep them. I would have chucked them out. I see treasured audio cassettes that I doubt I will ever listen to again, but note, our sound system is so old it does have a cassette player. The never used portable outdoor chairs have you sitting almost on the ground. It was not long ago that I decided we should keep them, well a few years perhaps. R and perhaps me to extent might have to do the undignified roll over to get up from them now. Our wicker sewing basket, used often enough by me to sew on a button on that is falling or has fallen off. My button sewing work may not be beautiful, but the button will stay in place until at least the year 3,000. There is also a stack of cds or dvds on the right. I have no idea what they are. Ah, I have remembered now. They were old..........err, umm, movies of a certain kind, transferred from video tape to dvd. Why did I bother? The quality would be awful. Joey Stefano did die, didn't he. I think Lon Flexx did too. Jeff Stryker? The interior of all of our wardrobes could do with a clean and paint, and as happy homemakers of the past, it would have been done. Guess what. They can stay as they are. I am on the slippery downhill slide of not noticing spillage of something down the kitchen cupboards or on my own shirt.